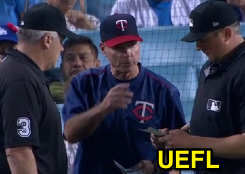 HP Umpire Lance Barrett misheard Paul Molitor's double switch request, causing a substitution Rule 5.10 delay in LA during Tuesday night's Twins-Dodgers game—with an odd resolution that involved the umpires ordering a player on the bench back onto the field while prohibiting Minnesota from using one of its bullpen relievers for the rest of the night. 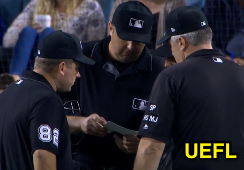 Crossed wires led to a lineup card dispute. We'll begin with a description of the play, with an explanation and analysis of the chaotic double switch's resolution, and video of the entire 18-minute sequence. In sum, though the plate umpire may have misheard Molitor, the crew properly applied the exhaustive, but seldom-seen collection of provisions within Rule 5.10 to bring about a legal resolution to a confusing play. 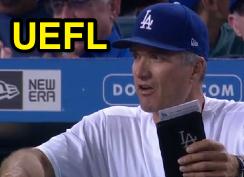 The Play: With none out and one on in the bottom of the 6th inning, Dodgers batter Chase Utley hit a 2-1 fastball from Twins pitcher Trevor Hildenberger on the ground to first baseman Joe Mauer for a groundout. After the play, Twins Manager Paul Molitor approached HP Umpire Lance Barrett to execute a double switch, replacing pitcher Hildenberger with position player Ehire Adrianza, while relief pitcher Ryan Pressly replaced shortstop Jorge Polanco, batting 7th, who had made the second out in the top of the 6th inning. Umpires Fagan, Barrett, Reynolds & Welke. The Discussion: Prompted by Bench Coach Bob Geren, Dodgers Manager Dave Roberts approached Barrett and a discussion amongst acting crew chief Bill Welke's crew ensued, play resumed, and Pressly threw ball one to Puig with Adrianza at shortstop in place of Rosario. Roberts then reemerged from the third-base dugout and appealed to Barrett for a further ruling as to Minnesota's substitution, upon which the crew reconvened, with Barrett and Welke approaching Molitor. The Dispute: Roberts referred to a discrepancy between the lineup displayed on the Dodger Stadium scoreboard—which showed Adrianza batting ninth (and due to lead off the top of the 7th) and pitcher Pressly in SS Polanco's seventh spot, and which reflected the Twins' defensive alignment on the playing field of Adrianza at shortstop, Rosario in left field, and Polanco on the bench—and what appeared on Barrett (and Geren)'s lineup card, which also placed Adrianza in the ninth spot in the batting order, but instead had Adrianza in left field, relief pitcher Matt Belisle batting fifth, in place of the subbed-out left fielder Rosario, and shortstop Polanco remaining in the game, batting seventh. The lineup on DodgerVision was wrong. Green text indicates the official card version. The umpires then donned the replay headsets to conduct a rules check with the Replay Operations Center. The Crew's Decision: Following the nearly-20-minute delay, the umpires placed Adrianza in Hildenberger's vacated nine-spot in the batting order (as they had initially done), while defensively, Adrianza was placed in left field to replace Rosario, whose fifth-spot in the batting order was assumed by relief pitcher Pressly. (Belisle and Rosario were ordered removed from the game). For the reasons below, this was the correct call. Sidebar (History Lesson): Welke must have learned his lesson since getting fined in 2013 after incorrectly applying similar substitution rules during an Astros pitching change that ultimately resulted in Mike Scioscia's decision to file a protest. This time, acting crew chief Welke got the call right. Related Post: Angels Protest After Wright Exists Without Throwing a Pitch (5/9/13). A similar mixup occurred in a 2012 game. Sidebar (Precedent): Believe it or not, this isn't the first time a miscommunicated double switch has wreaked havoc in a Major League game. In June 2012, Cardinals rookie skipper Mike Matheny was forced to remove first baseman Allen Craig from the game when his double-switch maneuver was lost in translation with HP Umpire Bob Davidson. Miami Manager Ozzie Guillen spoke with Crew Chief Jerry Layne about the discrepancy, which resulted in a somewhat similar outcome as occurred at Dodger Stadium on Tuesday night. Related Post: Ozzie Guillen Key Figure in Cardinals-Marlins Lineup Snafu (6/26/12). Substitution Rule: According to Official Baseball Rule 5.10(b) (which, back in Ozzie's day, was known as Rule 3.06), "The manager shall immediately notify the umpire-in chief of any substitution and shall state to the umpire-in-chief the substitute’s place in the batting order." Rule 5.10(b) Comment states, "To avoid any confusion, the manager should give the name of the substitute, his position in the batting order and his position on the field. When two or more substitute players of the defensive team enter the game at the same time, the manager shall, immediately before they take their positions as fielders, designate to the umpire-in-chief such players’ positions in the team’s batting order, and the umpire-in-chief shall so notify the official scorer. If this information is not immediately given to the umpire-in-chief, the umpire-in-chief shall have authority to designate the substitutes’ places in the batting order." Bench Coach Geren is the team's rules man. Analysis: Unlike a batting-out-of-order situation, there is no formal appeal play that can take place by the offensive team claiming a rules violation by the defense: there are no outs to grant, no other rewards to bestow, nor penalties to enforce. A multiple substitution (aka double-switch) concerns two simultaneous transactions. Throw out the batting order and defensive positioning for a second while we discuss this point. 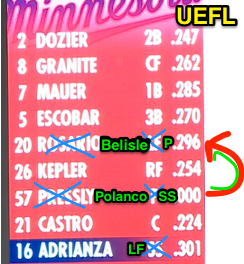 During the 6th inning on Tuesday, the two simultaneous substitutions on Barrett's official lineup card (and what was thus communicated to Roberts and Geren) were: 1) Adrianza for Hildenberger, and 2) Belisle for Rosario. As the green color-coding suggests, Adrianza-for-Hildenberger went off without a hitch as both players legally entered and exited the game. The problem exchange was Belisle for Rosario, which Molitor had intended as Pressly for Polanco (which is why Pressly assumed the mound and Polanco assumed the bench). It would appear Barrett heard "Belisle for Rosario" when Molitor said "Pressly for Polanco." In 2013, Dodger Thoughts blogger Jon Weisman (before he was hired by the team) wrote about how the music at Dodger Stadium had gotten much louder compared to previous years, causing even Vin Scully to complain, "Boy, the music is loud." Weisman continued, "I don't understand [for] whom they're making it loud for." Perhaps the loud music contributed to the communication error between Molitor and Barrett. Rules for Pre-First Pitch Detection: The relevant provision of Rule 5.10(d) states, "If a player who has been substituted for attempts to re-enter, or re-enters, the game in any capacity, the umpire-in-chief shall direct the player’s manager to remove such player from the game immediately upon noticing the player’s presence or upon being informed of the player’s improper presence by another umpire or by either manager. If such direction to remove the substituted for player occurs before play commences with the player improperly in the game, then the substitute player may enter the game." Welke and Barrett discuss with Molitor. The relevant portion of OBR 5.10(h) states, "If an improper substitution is made for the pitcher, the umpire shall direct the proper pitcher to return to the game until the provisions of this rule are fulfilled." (according to 5.10(g), "the substitute pitcher shall pitch to the batter then at bat, or any substitute batter, until such batter is put out or reaches first base, or until the offensive team is put out, unless the substitute pitcher sustains injury or illness which, in the umpire-in-chief’s judgment, incapacitates him for further play as a pitcher"). What this means: Had the situation been caught before play commenced, with substituted-for Rosario remaining in the game as the left fielder and substitute player Belisle still in the bullpen, UIC Barrett could have simply reconciled the on-field defensive alignment to match the official lineup cards (e.g., by placing P Belisle into the game as batting fifth, keeping SS Polanco as seventh, and substitute Adrianza as ninth, while ordering LF Rosario out of the game and keeping bullpen player Pressly as eligible for later substitution). 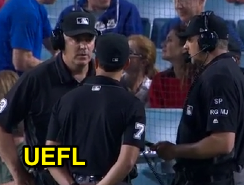 Alas, Welke's crew only became aware of the discrepancy after a pitch had already been thrown to Puig, thanks to Robert's strategic decision to wait before introducing the issue in earnest to the crew. Welke, Reynolds and Barrett finish their talk. Rules for Post-Pitch Detection: Rule 5.10(d) contains the key for what should happen in the event that play proceeds after an improper substitution has been made: "If such direction to remove the substituted-for player occurs after play has commenced with the substituted-for player in the game, then the substitute player shall be deemed to have been removed from the game (in addition to the removal of the substituted-for player) and shall not enter the game." To translate, if the infraction is discovered after play commences—as it was here—substitute player Belisle would be prohibited from entering the game...but wait, isn't Belisle a pitcher and required to face at least one batter? Rule 5.10(h) continues, "If the improper pitcher is permitted to pitch, any play that results is legal. The improper pitcher becomes the proper pitcher as soon as he makes his first pitch to the batter, or as soon as any runner is put out." What this means: Because improper pitcher Pressly threw a pitch to batter Puig, he thereby became the proper pitcher. Accordingly, per OBR 5.10(d), Belisle was prohibited from entering the game due to play having commenced before the substitution infraction was discovered. In other words, Geren prodded Roberts to wait until a pitch had been thrown to ensure that the Dodgers would not have to face Belisle at any point during the game (and to shorten Minnesota's bullpen options while getting LF Rosario out of the game). Note about 5.10(d) vs 5.10(h) Timelines: Rule 5.10(d) refers to "play has commenced," whereas 5.10(h) refers to "his first pitch to the batter, or as soon as any runner is put out." Thus, with a runner on second base, had improper pitcher Pressly attempted a pickoff, 5.10(d)'s "play has commenced" criterion would be satisfied, but 5.10(h)'s would not (unless the pickoff retired the runner). Thus, had the infraction been discovered only after this hypothetical unsuccessful pickoff but before an actual pitch was thrown to Puig, here's what would have happened: 1) Belisle would have been ordered into the game to face Puig. 2) After Puig completed his at-bat, Belisle would have been ordered out of the game. Finally, OBR 5.10(d) states, "A player once removed from a game shall not re-enter that game." The only remaining question is whether SS Polanco, by going into the dugout, was "removed from the game." 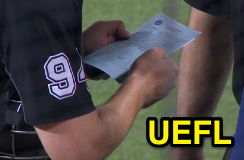 Rule 5.10(j) concerns unannounced substitutions, and states that a substitute shall be considered as having entered the game when "he reaches the position usually occupied by the fielder he has replaced, and play commences." But this clearly cannot apply, as during a multiple substitution (double switch), the substitute replaces a player whose position is different than his own (e.g., Adrianza replaced pitcher Hildenberger); recall that Adrianza's substitution is not at issue here: only Belisle for Rosario, versus Pressly for Polanco. As such, the rule ultimately fails to address a double switch situation in which an unannounced substitution (which is also in contravention of the official record) takes place and the improper pitcher has become the proper pitcher by virtue of throwing a pitch. Based on the 2012 Cardinals-Marlins situation, past practice supports placing positions players at their proper locations so as to match their eligible status as indicated on the lineup card. Because Polanco was listed as the shortstop on such card, he was still in the game and did not violate Rule 5.10(d) by assuming his position at shortstop, because the player physically at shortstop for that first pitch thrown to Puig—Adrianza—was the substitute for Hildenberger, who was properly removed from the game. Conclusion: In other words, Barrett purportedly misheard Molitor's "Pressly for Polanco" as "Belisle for Rosario." However, the crew properly officiated the aftermath, including discovery of the infraction after a pitch had already been thrown by an originally-improper pitcher, who, by virtue of Rule 5.10(h), was now proper.